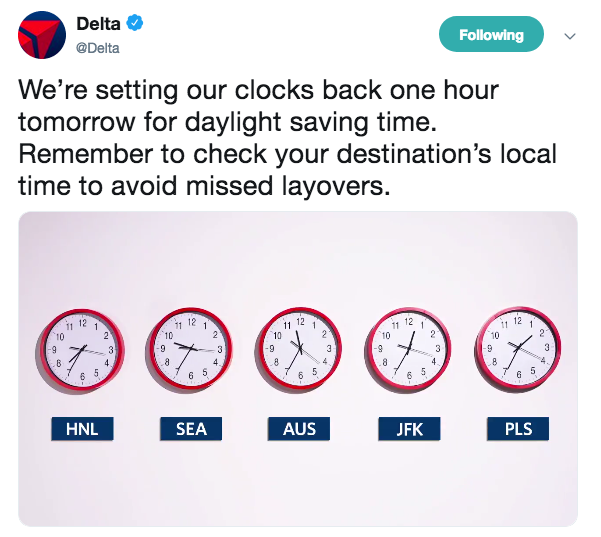 The U.S. has just switched back (Nov 4th) to Standard Time from Daylight Savings Time and apparently airlines had experienced troubles with customers missing their flights in the past so many of them reminded this year to check the time carefully. The departure times will remain the same but there might be a discrepancy with your airlines original schedule that was received when making the booking though in theory there shouldn’t be. Airlines usually do incorporate all time changes including Daylight Savings swaps into their schedule yet sometimes there is a glitch and that results in passengers receiving incorrect information. I have a United Airlines reservation from Hong Kong to San Francisco and return this week which for some odd reason seems to be an hour longer per indication in the reservation than usual. I chalk that down to maybe a daylight savings problem as well. It also doesn’t make any sense when taking the flights usual arrival time into consideration. Have a look in case you got some flight reservations this week as there might be a few mix ups but as I said usually there shouldn’t be. I’m glad I had a look on my United reservation though because I had to book myself a connection on a separate ticket and would love to leave sufficient time in between so I won’t miss the flight for which I also need to check in separately once arriving in HKG next week.